Selecto water filtration technology and constant R&D efforts play a key role in providing the purest water for drinking, and vital pharmaceutical, food and industrial processing needs. The fact that we are leading the innovation in the field is well recognized by our loyal customers. Selecto’s Hollow Carbon filtration technology is a single-formula, simple-to-use, and flexible solution for all water-quality issues. The actual filter configuration and our proprietary activated carbon combine to remove the particulate matter that affects taste, odor and health, and causes scale that degrades all water-use systems, reducing their reliability and service life, while raising maintenance and replacement costs. 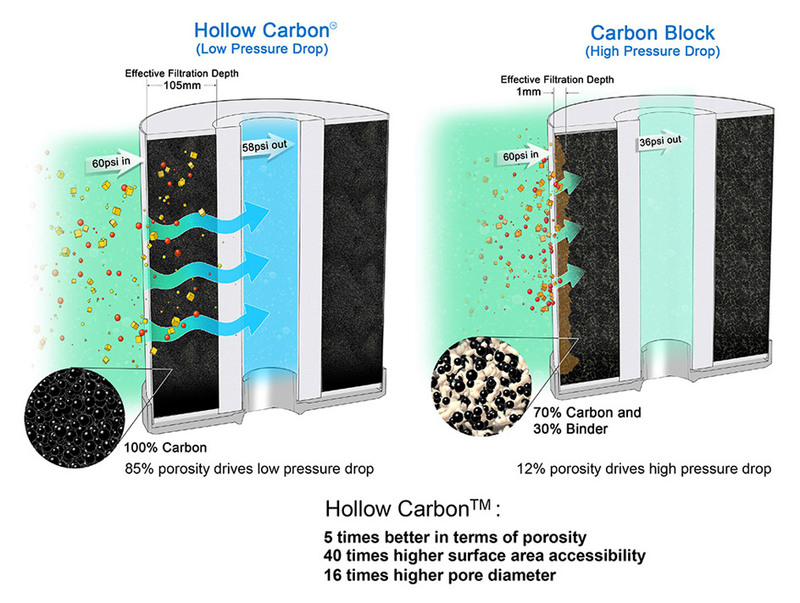 Selecto’s proprietary Hollow Carbon filtration technology is a patented thermal treatment of activated carbon. It creates a structure with oxide-free surfaces and unique porosity (pore) structures. The filter design is engineered to use a proprietary combination of turbo flow and radial flow to create a longer contact time than traditional water filters, significantly improving performance. In contrast to the standard Carbon-Block technology that utilizes a mixture of some type of a binding material and carbon, Selecto’s Hollow Carbon filters contain 100% activated carbon, a fact that has multiple practical implications. The significantly higher surface area and porosity of the Hollow Carbon, as well as the extremely high and variable pore diameter, result in the adsorption, catalytic conversion and mechanical filtration of impurities in the water, and deliver an impressive effective filtration depth of 105mm. Consistent performance with minimal pressure drop even following 12 months of continuous operation. Selecto filters allow users to reduce chlorine, chloramines, scale, bad taste and odor, and particulates (0.5 – 1.0 micron) at the highest NSF listed flow rates available in the market, of 5 GPM to 15 GPM (gallons per minute) with virtually no pressure drop. The typical carbon block, however, in addition to its tendency to break easily, also clogs very quickly due to its low porosity, and consequently, its small effective filtration rate – only 1mm. Poor performance and consequently, frequent and a costly replacement schedule.